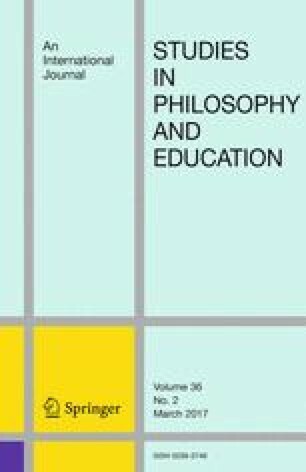 The final-year undergraduate dissertation is commonplace in Education Studies programmes across the world and yet its philosophical assumptions are complex and not always questioned. In England there is evidence to suggest a tacit preference for empiricism in textbooks designed to support early researchers. This brings, we suggest, problems associated with dualism, instrumentalism and of accounting for value, redolent of the dilemmas that emerge from Hume’s empiricist epistemology. The paper suggests that if argumentation were explicitly taught to undergraduates it may help oversee the more judicious use of empirical approaches that are currently privileged in dissertation guidance. Brown University. 2015. Honors in education studies: Process for writing a senior thesis. http://www.brown.edu/academics/education/undergraduate/honors/honors-education-studies. Accessed 20 May 2015. Freie Universität Berlin. 2015. Bachelor’s degree programs at Freie Universität Berlin: Academic program structure. http://www.fu-berlin.de/en/studium/information_a-z/bachelorstudium/index.html. Accessed 20 May 2015. Healey, M. 2011. Rethinking the undergraduate dissertation. In The guardian 28th June. http://www.guardian.co.uk/higher-education-network/blog/2011/jun/28/flexible-dissertations-for-undergraduates. Accessed 3 Nov 2014. Mackenzie, N., S. Knipe. 2006. Research dilemmas: Paradigms, methods and methodology. Issues in educational research 16. http://dd6lh4cz5h.search.serialssolutions.com/. Accessed 3 Nov 2014. Portland State University. 2015. Senior thesis. https://www.pdx.edu/honors/senior-thesis. Accessed 20 May 2015. Quality Assurance Agency for Higher Education (QAA). 2015. http://www.qaa.ac.uk/en/Publications/Documents/SBS-education-studies-15.pdf. Accessed 23 Feb 2016. University of Glasgow. 2015. Honours dissertation—Primary education DUMF4010P. http://www.gla.ac.uk/coursecatalogue/course/?code=DUMF4010P. Accessed 20 May 2015. University of Gloucester. 2015. EDS333: Education studies dissertation. http://www2.glos.ac.uk/mda/2010-11/undergraduatefields/eds/descriptors/eds333.asp. Accessed 3 Nov 2014. University of Gloucestershire. 2016. EDS333: Education studies dissertation. http://www2.glos.ac.uk/mda/2010-11/undergraduatefields/eds/descriptors/eds333.asp. Accessed 28 Feb 2016. Universität Göttingen. 2015. Guideline for bachelor’s thesis and master’s thesis: Leitfaden für die Erstellung von Seminar-, Haus- oder Projektarbeiten sowie Bachelor- und Masterabschlussarbeiten. www.uni-goettingen.de/en/studies/31834.html. Accessed 20 May 2015. University of Malta. 2008. B.Ed. (Hons.) Dissertation Committee, B.Ed. (Hons.) Dissertation guidebook (2nd ed.). www.um.edu.mt/educ/downloads. Accessed 20 May 2015. University of Nebraska. 2015. University honors program. http://unomaha.smartcatalogiq.com/en/2011-2012/Undergraduate-Catalog/Majors-Offered-and-Class-Requirements-by-College/Campus-Wide-Programs/University-Honors-Program. Accessed 20 May 2015. University of Waikato. 2015. Paper details: Research methods.<http://papers.waikato.ac.nz/subjects/EDUC/DSOE557. Accessed 21 May 2015. University of Winchester. 2015. Education studies ES 3001/2 procedures—Dissertation: Preparing a proposal. http://www2.winchester.ac.uk/edstudies/courses/ES3002%20Final%20Year%20Project.htm. Accessed 20 May 2015.